Everybody talkin’ ’bout heaven ain’t goin’ there. A few days ago my husband mentioned that his study group was reading a book that talked a lot about heaven. I reminded him, “Ever’body talkin’ ’bout heaven ain’t goin’ there.” The Bible talks very little about heaven, but it talks a lot about behavior. Another popular topic of conversation and study among Christians is end times and the second coming. The Bible discusses these a little more than heaven, but not much, to be honest. That’s because it’s busy discussing behavior. The entire Judeo-Christian community devotes a great deal of time and effort to theology, which the Bible gives moderate attention to; however, overall the Bible is much less devoted to theology than it is to behavior. Given this emphasis in the Bible, I’ve come to the conclusion that God is more interested in our behavior than in informing us about heaven, end times, or theology. We’re going to spend the weeks between now and Easter looking at what God, speaking through the writers of the New Testament, has to say about how Christians are supposed to behave. Peter says that faith - the sole basis of our eternal salvation - is fundamental, but faith is just the beginning of our Christian life. Virtue is good, but we mustn't stop with faith and virtue. Knowledge is important, but faith, virtue, and knowledge are not enough. Growing in these qualities and five more is essential, Peter says, to make us effective and fruitful Christians. The first thing you have to know about living the Christian life is that each of us lives it in common with all other Christians, here and everywhere, past, present, and future. This is because all of us together form the body of Christ. The original body of Christ was that of Jesus of Nazareth. He was the whole body. 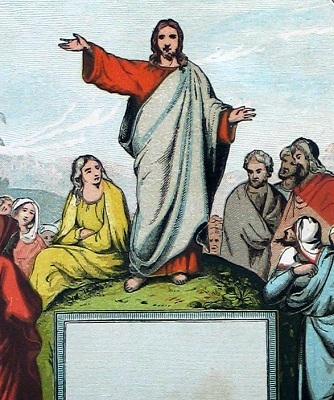 In speaking to his disciples, however, he made it clear that the body was expanding. Exactly as the trunk of the grape vine grows branches, Jesus Christ grew Christians to be part of his body. Exactly as the branches of a vine are expected to produce fruit, Christians are expected to produce fruit. Branches that stay attached to the vine are taken care of so that they can produce more fruit, but branches that become detached wither and die. In the same way, Christians who stay attached to Jesus produce fruit and are taken care of so that they bear more fruit, and Christians who become separated from Jesus wither and die. So what do you think? Would you rather be blind or deaf? Lame or mute? Would you rather have liver disease or heart disease? Can you even think clearly about the question when your back aches? Paul reminds us that we are all parts of the one body of Christ, and each one of us is important and depends on every other one. It’s difficult to be a Christian in isolation. I think we all understand that it is our duty and pleasure as Christians to serve others. Jesus says something a little more difficult here: it’s also important to let others serve us. Even though receiving a gift or service can make us uncomfortable, especially if we have no way of reciprocating, we need to learn humility from both directions. If our fellow-Christians need something, we should attempt to provide it, even if it means humbling ourselves to wash their feet. On the other hand, if we need something, we should allow others to provide it, even if it means humbling ourselves to let them wash our feet. When our oldest was a teenager, we used to call him “the Midnight Raider.” Items we had expected to use for dinner the next day would disappear during the night. His body needed nourishment, because he was growing. In the same way, the body of Christ needs nourishment, both collectively and individually. God has provided some of this nourishment in the form of apostles, prophets, evangelists, shepherds, and teachers. They teach us our calling: humility, gentleness, patience, and love, all of which allow us to grow in Christ. The illustration of Jesus calling us to Christian living is from the family Bible of John O. Spencer and Lydia Bunn, married 18 Nov. 1857 in Hector, Schuyler Co., NY. 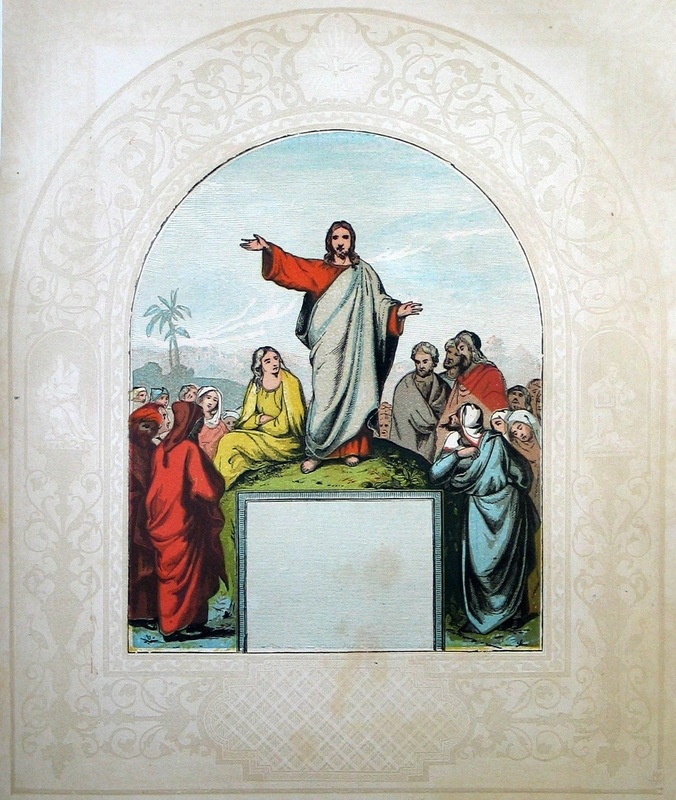 A complete listing of the posted images from this Bible is given at Ducks in a Row, Inc.